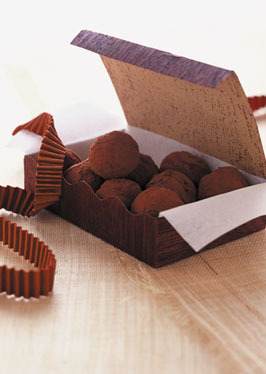 In a blender or food processor, chop the chocolate very fine. Heat the whipping cream just to the boiling point. Immediately remove the blender cover and add the hot cream all at once. Cover and process until fully blended and perfectly smooth. Next add the butter and blend just a second or two more until creamy. Place container in the refrigerator for a few minutes. When batch is firm enough to be shaped, remove from the refrigerator and form into small balls. Roll in cocoa powder. These can be made ahead and stored up to 2 weeks in the refrigerator. Serve immediately or store on waxed paper in an airtight container in the refrigerator.